Last updated 19 March 2018 . By Leighanne Bent. Don’t cha just love it when you fight through a G&T-induced hangover and travel to the other side of London to be told that you’re at the wrong restaurant? Arriving late enough to make Kayne West proud, here’s what happened after I dragged my sorrowful self away from Stoke Newington and made my way to The Good Egg on Kingly Street... where I was meant to be in the first place. Having had a sneak peek at the interiors at The Good Egg in Stoke Newington thanks to my little Sunday blunder (hello, silver lining), I was shocked at how different the interiors were in both restaurants. Disregarding the minimalist, wooden touches of its first home, the new Kingly plot resembled the inside Malibu Barbie’s beach house. Everything was matching - the floors were turquoise, the seats were turquoise, hell - even some of the plates were turquoise. Adding a blob of colour with baby pink walls pinned with mirrors and a neon sign reading ‘The Good Egg’, it’s clear that the aim of the game with this new restaurant was to make it as Instagrammable as possible. 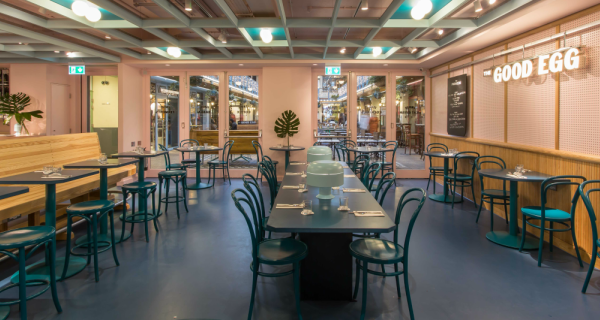 Situated in Kingly Court, The Good Egg has a glorious alfresco area too, giving diners another reason to pop by come summer if they managed to tire it out in the winter months. 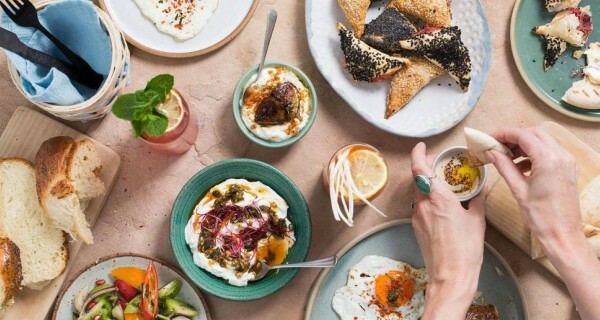 The Good Egg is the polar opposite to its sister venue in Stoke Newington with bright pops of colour and matching everything. The last time I gave something up for Lent I was 12 years old, and I reminded my mother about my sacrifice every single day. 13 years later, I took up the challenge again; but instead of giving up sugar and whinging to my mother, I decided to give up meat and talk about how 'nutritionally gratified' I felt to anyone and everyone who'd listen. Going strong with my weekly shop for all things vegetable at Sainsbury's; eyeing up my friend's cornbread French toast that she ordered with a generous side of bacon at The Good Egg was the first time I actually wanted to throw in the towel and revel in the salty greatness that is bacon. Coming to terms with the fact that the crispy bacon on the other side of the table wouldn’t be helping my return to a non-hungover state, I ordered the grain bowl. Packed with fresh kale, crunchy cauliflower, butternut squash, with a boiled egg plonked in the middle and a side of tahini sauce, my palate was bombarded with flavours and spices. A little bit disappointed that nothing in front of me was warm - the grain bowl is a cold dish, folks - the real comfort came from our side orders. The crispy halloumi came out crisp and golden, in generous sized chunks, and the fried eggs and herbs were beautifully runny in the middle. Staying away from The Good Egg's brunch cocktails to gulp down two cups of tea before our journey home (yes - my hangover was that bad), we ordered the chocolate bark with salted tahini and sour cherry as a Sunday treat. Indulgently rich and punctured with tiny pieces of cherry, it was a handmade triumph and quite possibly the highlight of my meal. The Jewish-inspired menu at The Good Egg was varied and full of suprizes. Instagram-ready with a roster of globally-inspired dishes? I might have rolled up to The Good Egg in a Kanye West-like fashion time-wise, but instead of spitting the lyrics 'you should be honoured by my lateness' I found myself almost bowing to the floor in gratitude that they kept my table reservation for so long. Not afraid to be unique and stepping out of the shadow of its older sister - i'll put money on it that this place will make big waves with its brunch offering in 2018. Irish version of Bridget Jones who has a deep love for all things prosecco.